When I first saw the magnificent .50cal machinegun from MiniWorld, I just knew I had to do a comparison scan with the other .50cals we have available to us. When looking at the scan below, we see a huge variation in size and quality between many of these parts. When we put so much effort into accurizing and detailing our tank models, why not put the same effort into the machinegun mounted on its turret? Take a look at the scan, and then look below for some comments on the specific pieces. Mini World - I put the brass gun from Mini World at the top, because that is the finest example we have of the .50cal machinegun in this scale, and all others should be compared to it. Based on specifications I found on-line, this piece scales out very well for 1/72nd, perhaps just a hair long. ExtraTech - The resin Extratech gun is sold as part of an accessory set including the .50cal machinegun and a bazooka (#72009), as well as with several of Extratech's resin vehicle kits, and the ExtraPack versions of their plastic tank destroyer kits. Dragon - This gun is included in all of Dragon's Sherman tank kits on the hull details sprue. Although for a couple of tanks that are not intended to have a turret mounted .50cal (the Sherman III comes to mind), the handgrips for the machinegun are not included. Heller - Included in both the M4 and M4A2 kits. Italeri/ESCI - This is the gun included with the former ESCI M4A1 and M4A3 kits. Italeri's quickbuild Shermans include a different piece, which looks to be well detailed, but with the ammunition box molded directly onto the side of the gun. Trumpeter - Included in all of Trumpeter's Sherman kits. Unimodel - Included in all of Unimodel's Sherman kits. Revell - Worst piece in this line-up. ExtraTech/Eduard - This plastic piece is included with all of Extratech's tank destroyer kits, as well as Eduard's Sherman kits. 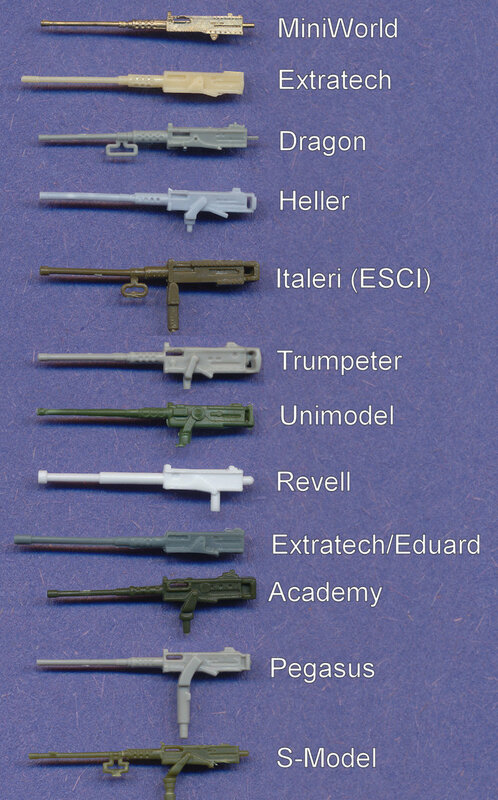 The Extrapack versions of the tank destroyers include the resin gun seen above, but the Profipack versions of the Eduard Shermans do not include the resin gun. Academy - This gun comes with Academy's World War II Ground Vehicles Set 2 (#13404), which includes a 2.5ton Truck, and a whole pile of accessories. Pegasus/Trumpeter - This is the gun included in the M26/M46 kits from these two manufacturers. As you can see, it is an improvement over Trumpeter's previous gun included in their Sherman kits. S-Model - This pedestal-mounted .50cal is included in S-Model's Willys Jeep kits. I am sure this comparison has missed a couple of available kit guns. I did not include .50cals from modern tanks, though many of them are really very nice. I also didn't include the guns from the quickbuild wargaming kits, such as Italeri and Armourfast. There may also be some resin pieces available in some older resin Sherman kits, such as Leva, and perhaps others. These are small parts; but they are not quite as small as the .30cal machinegun. Therefore, it's up to you what level of precision is necessary when it comes to scale accuracy. For myself, there are a few pieces in this comparison that I would not use, not only for their size problems, but also because of poor detail, such as ESCI and Revell. Almost all of these guns could benefit from the replacement gun barrel available from Schatton. There are also etched details for these machineguns contained within several of the Sherman photoetched detail sets from various manufacturers (the sets from Eduard are particularly nice). Most of these sets include replacement handgrips, barrel handle and ammunition box cradles. The better sets also include a replacement for the short length of perforated jacket at the base of the barrel. As is obvious in the scan above, many of the plastic guns could really use that.